Joseph Crétin was born in Montleuil, France in 1799. After attending seminary in Paris, he was ordained a priest in 1823 and served as a parish priest in the Diocese of Belley from 1823-38. Following the invitation of Bishop Mathias Loras, the first bishop of Dubuque, Iowa, who was an old friend, Fr. 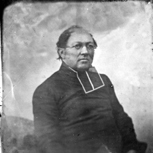 Crétin became a missionary. He ministered to the Native Americans in the Diocese of Dubuque, which at that time included what is now Minnesota. He was appointed bishop of the newly formed Diocese of Saint Paul and was ordained its first bishop on January 26th, 1851. Bishop Crétin built two cathedrals during his tenure in Saint Paul, as well as a hospital, schools, and established cemeteries. He desired to colonize the area with Catholics, so he endeavored to provide for the growth of his diocese by bringing Catholic immigrants from European countries to the fertile plains of Minnesota. Possessing an ardent missionary spirit, he continued to minister to the Native travelled through the vast extent of this diocese, which at that time encompassed all of Minnesota and the Dakotas.